Explorations in Quilting and Life: Another Fun Bernina Club Day! Another Fun Bernina Club Day! Last Thursday was my day to play and learn. I went down to the Bobbin Case for a day of friendship and sewing. We actually spent most of the morning on 'show and tell' as there was some great sharing on techniques we used, resources available. We didn't get to the day's project until the morning club time was almost done. The project was a little fabric bag with handles that you could put on a table, etc. and use to put things in. It was a very simple pattern that Linda (the owner) knew we could put together in no time at all. I, of course, was determined to complete mine in my record time so I could also play in the afternoon embroidery class and go home with a finished project. As a result, I decided not to put handles on my bag - I intended to put it on my sewing table for bits of thread etc. I also stitched the bottom corners differently than what we were supposed to do but found the result totally suitable for my purpose and left it as such. 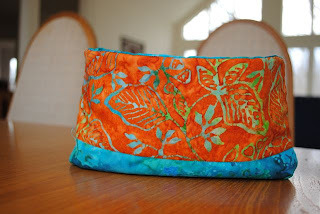 Here is what I created - I loved the colors - two fat quarters I picked up on my Arizona trip in March for just this project. Of course, I will smile everytime I drop a thread in it as it will serve as a reminder of a fun day with some great people.